The ability to easily create and share information is an essential requirement for businesses and classrooms alike. The service described on this page, turns text selected in any document into a web-application, ideal for viewing on iPads and iPhones. Additionally, the service offers options to include images, MPEG audio, or MPEG video files in the created publications. To learn more about Services in Mac OS X, visit MACOSXAUTOMATION.COM. The ability to easily create a web-application is provided by an Automator action included with the service installation. This action's user-interface is displayed in a dialog when the service is launched, and offers options for titling and attributing the article, and for including image and/or video content. Here's an overview of the action interface controls. Title - Enter the title of the article in this text field (1). Byline - Enter the author attribution in this text field (2). Copyright - Enter any copyright information in this text field. Copyright data will be placed at the end of the article. Creative Commons license - You may choose to distribute your work under a license from the Creative Commons organization. Pick on e of the licensing options from this popup menu and the cooresponding CC license will be added to the end of the article. (4). Media File - Optionally, the article can contain a single image, audio, or video file, which will be placed at the beginning of the article. Chosen image files will be copied and scaled to fit within 1024 pixels. A chosen audio file in AIFF, WAVE, or SDII format, will be copied and encoded automatically to MPEG (ACC) format for inclusion in the web-app bundle. Chosen video files will not be automatically encoded and are expected to be already encoded in iPad-captible MPEG format (5). Caption - Enter a caption to be placed beneath the media file in the article layout.(6). Use Embedded Image Caption - Select this checkbox (7) if you want to use the embedded IPTC description data in the chosen image, as the caption. Description - Enter a description of the article to be placed in the header of the generated HTML file, for indexing by Internet search engines (8). Keywords - Enter a comma-delimited list of keywords to be placed in the header of the generated HTML file, for indexing by Internet search engines (9). The installers include multiple Automator service workflows, one for creating a multi-column article web-app from the text selected in a document or window, and other services for preparing media, and distributing the resulting web-app. 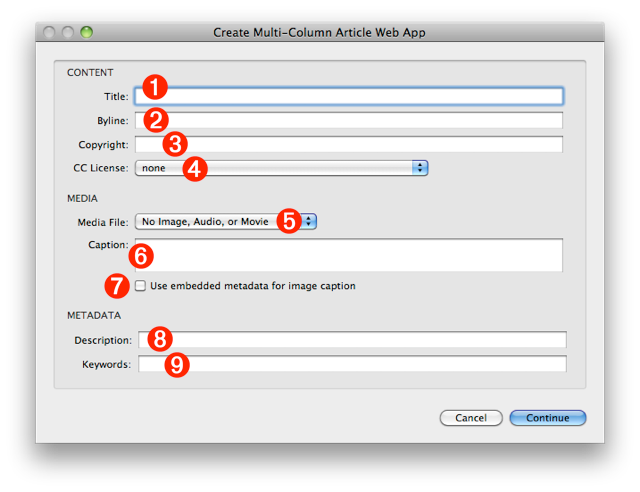 Create Article for iPad with Selected Text - This service will create a multi-column article web-app from the text selected in a document or window. 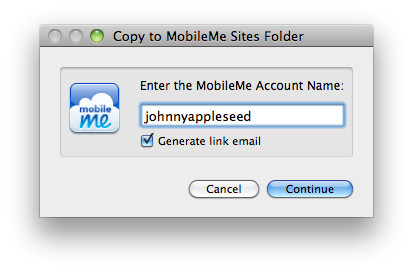 In many Mac OS X applications, this service will be listed on the hosting application's contextual menu. If not, it should be available from the Services menu in the Application menu. Media Preparation Services - Two services useful for converting video and audio files to the proper formats for inclusion in web-application. Video files added to articles must be in MPEG (.m4v) format, and audio files must be in MPEG (.m4a) format. Movie • Encode Media - This service will encode movie files (.mov) selected in the Finder, to MPEG files (.m4v) for use with AppleTV, iPod, iPhone, or the iPad. Audio • Encode to iTunes Audio - This service will encode selected audio files of WAV, AIFF, or SDII formats, to MPEG (.m4a) files for use with the iPod, iPhone, or the iPad. The result of the creation process is a folder on the desktop containing the files, images, and media that comprise the web-application. Once the processing is completed, the service will open the application in Safari for you to try out. 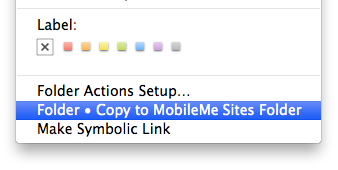 Once posted to your MobileMe iDisk, the web-app will be viewable on any iPad with an internet connection. To enable full-screen viewing of the web-app on the iPad, follow these instructions. Titles and authors are required. An image's caption is derived from its embedded IPTC description (caption) data. You can use the Add Metadata to JPEGs service provided on MACOSXAUTOMATION.COM to write caption, titles, and keywords metadata into JPEG images selected in the Finder. 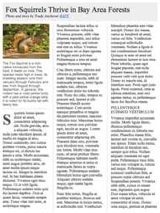 An example of a scrolling multi-column article containing a picture. An example of a scrolling multi-column article containing a video.